Well before Peter Jackson's 1994 movie Heavenly creatures, the 1954 Parker–Hulme murders (in which two Christchurch teenage girls killed one of their mothers) were featured in Michelanne Foster's play Daughters of heaven. Her play premiered at Christchurch's Court Theatre in 1991 and was published the following year by Victoria University Press. 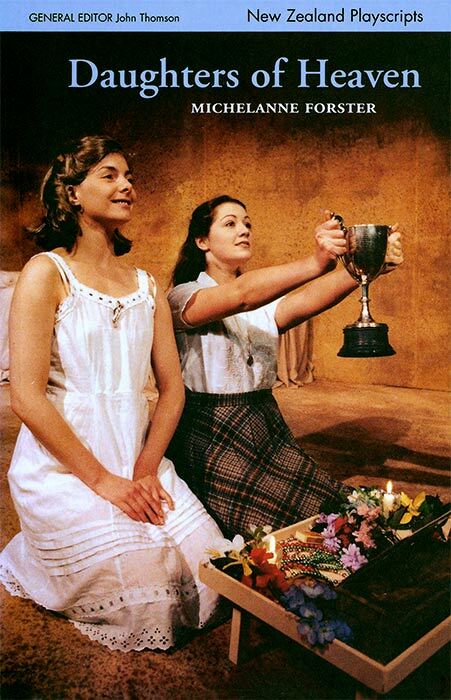 This is the cover of the published script, showing Nancy Schroder (left) as Juliet Hulme and Louise Frost as Pauline Parker, from the original Court production.